‘Screen For Life’, Qatar’s National Breast and Bowel Cancer Screening programme, is leading the mission to ease the burden of cancer on the country and help build a healthier, happier population through its ongoing, wide-ranging awareness drive and outreach programme. ‘Screen For Life’is a fullservice network of highlyskilled professionals off ering step-by-step, best practice patient support in line with the Primary Health Care Corporation’s (PHCC) mission to provide the people of Qatar with world-class cancer screening services. The ‘Screen For Life’ marketing team works tirelessly to engage with communities to share the goals of the programme and enhance breast and bowel cancer awareness levels across the country. Furthermore, the support process begins with the programme’s dedicated staff at the ‘Screen For Life’ call centre (8001112) contacting eligible people, inviting them to attend a screening. On the day of screening, the patient is welcomed by a PHCC nurse who provides a full briefi ng on the process and procedures. 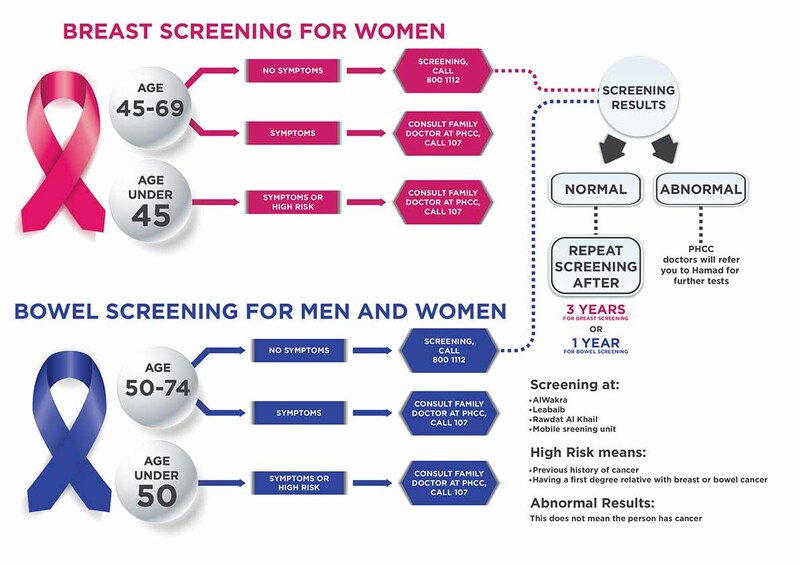 If the results are normal, the patient will be invited back for another screening after three years for breast cancer screening, or 12 months for bowel screening. However, if the results are abnormal, this does not mean necessarily the patient has cancer, it means they need further assessment. ‘Screen For Life’ guides the patient closely through the next steps and secures an appointment with specialists at Hamad Medical Corporation ( HMC). This stage emphasises the close collaboration between the two entities, in off ering full support to the participants that extends beyond the Programme’s role to the post screening stage that includes assessment, treatment and council. “Understandably, people can be struck by the fear factor when having to deal with health issues. This underscores the importance of our close collaboration with HMC, to ensure that the process is completed in a short space of time and participants do not have to wait long for their appointments,” said Dr Shaikha Abu Shaikha, manager, Cancer Programme, PHCC. After assessment at HMC, ‘Screen For Life’ continues to remain at the patient’s side to off er support and follow up with the specialists for the results. If the results are normal, the patient is invited to attend another screening later. If a patient tests positive for cancer, ‘Screen For Life’ provides further support, reminding them that the survival rate is particularly high, especially in cases where the cancer was caught early.